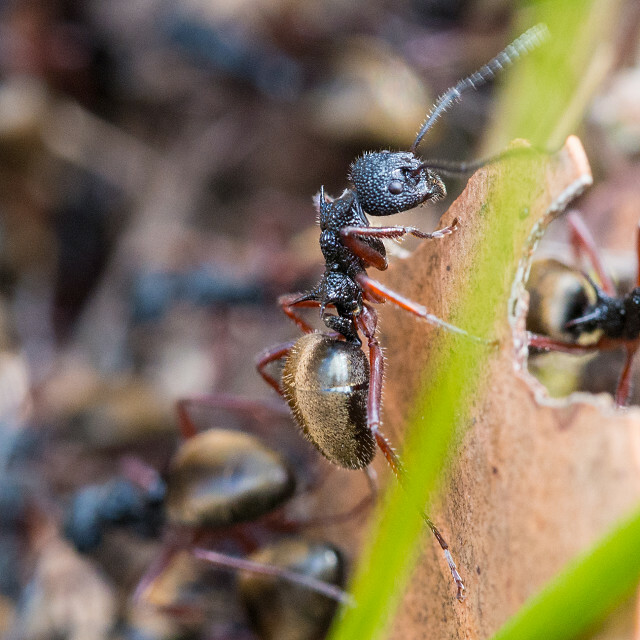 I found a nest of these very attractive ants a few years ago in the bush and thought I'd just keep an eye out today, while on our bush walk, just in case I saw some more and I did! I found a couple on a tree and looked down and there was a seething mass of them in the grass at the base of the tree. They aren't all that big - about 6 to 8mm, but are quite striking when you see all those lovely shiny golden abdomens moving about en masse. I have to say that they are very hard to photograph - I had sandals on and really didn't want them crawling up my legs, so didn't want to get too close, and the light wasn't great and they were all moving constantly - quite challenging! This is the best I was able to get and I did have some nice flower shots today, but decided I wasn't very likely to see the ants again for a while, and flowers are easier to come by.